Turning their dial to adventure, NASA is currently crunching numbers and working through the logistics of how to build a lunar outpost by 2020. Instead of coming up to the Moon for a quick night cap as we have in the past, we intend to extend our stay by inhabiting it. Missions such as LCROSS, which are sending an SUV-size payload to literally impact the Moon in October in order to analyze the resulting plume of regolith for ice crystals (a substance which could prove useful for people living on the Moon), are already helping advance our understanding for what a lunar outpost requires. The latest in lunar gadgetry hit the news today, being positioned as a Swiss army knife of sorts, in the words of the Space Review's Taylor Dinerman. 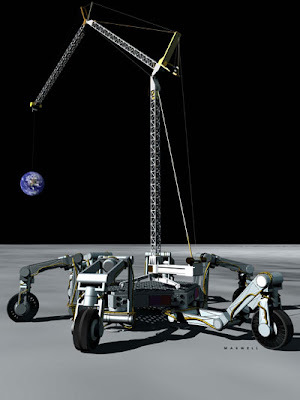 Called the Lunar Surface Manipulator System (LSMS), this lightweight crane is capable of various cargo unloading and construction tasks that a lunar lander would otherwise have difficulty with. With the LSMS's powers combined, similar to something out of Captain Planet or a Power Rangers Megazord, it can produce more monumental tasks. NASA's lunar vehicles such as ATHLETE (All-Terrain Hex-Legged Extra-Terrestrial Explorer) and Chariot (a 12-wheeled lunar truck) could be configured to give the robotic arm more bang for the buck. [The LSMS's] essential role, however, is logistical: unloading supplies from the Altair lander or even from a commercial lunar surface delivery service derived from the technology that is now being devoted to the Google Lunar X PRIZE systems. At some point soon standardization of sizes, coupling devices, and weights of space supply containers is going to be needed. NASA cannot do this alone: it needs to negotiate agreements with the other major spacefaring nations, particularly those who have announced that they want to join in the lunar development process.